Most people need something to aim for. It’s the reason organizational vision and values are important. It’s also why we develop objectives, goals, strategies and measures (OGSM and other strategy plans). “Big picture” objectives drive most of the goals we set. That’s a good thing. Each type of goal—short, medium or long-term—has an important place in the process. Recognize that every long-term objective rises and falls on details, next steps and daily to-do lists. If the small things remain undone, the greater goal simply won’t have traction. Short-term goals create a “next step” culture. It’s helpful to think in terms of next steps. Ask youself: What’s the best thing I can do to move one step closer to a long-term goal? It’s amazing what you can accomplish when you spend intentional time every day on smaller goals, inching ever closer to larger objectives. Short-term goals provide a psychological boost. Long-term (think annual) goals and objectives may seem unrealistic or difficult. Adjust your thinking with a focus on the day, week or month ahead. Be specific with short-term goals and due dates, but don’t be anxious about the long-term objective. Instead, give your mind a mental boost by focusing on achieving this week’s goals. Short-term goals provide for supervisor-employee feedback. Most of us need objective feedback and accountability to stay on track. Short-term goals provide for that in small, timely and specific ways. Monthly supervisor-employee coaching, mentoring and other feedback built around a discussion of short-term goals helps you know where you’re succeeding and where there’s room for improvement. Short-term goals create space for adjustments to “big picture” plans. 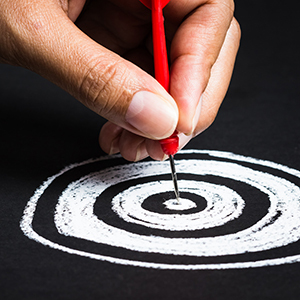 Annual goals and objectives are the “big picture” plans you’re striving for. Breaking down those long-term goals into smaller segments is a good idea. If there’s a problem with your “big picture” plan, you’ll discover it as you implement the plan and aim toward a short-term goal. Short-term goals help you adapt to changing conditions on the fly and adjust the long-term objective. Establish short-term goals as a first step towards achieving larger personal, professional and organizational goals. Spend intentional time every day on smaller goals, inching ever closer to your long-term objectives.